Manuel Scrima is an Italian-Belgium photographer, director and artist who’s work resides on several continents. It is always visible in his artwork a sense of classic and neoclassical inspiration often derived from distant and exotic cultures. The year of 2006, marked a corner stone in his career: His engagement with the majestic primordial nature rooted at the heart of African culture. “Africa Awakens” is his most renowned and successful exhibition to date. Hitting both galleries and museums in France, England, Ireland, Finland, Italy and Kenya. This exhibition is created in support of two Kenyan ONG - ICROSS and NWI - and Manuel use the images to raise money for their projects. His images incontrovertibly portray the dignity and beauty of a continent disrespected and misconceived by the media. These installations are reinforced by international realities such as: UNESCO, Doctors Without Borders and CARE International. UNESCO appointed him as the solo artist to exhibit and celebrate the culture of Kenya . In 2010, some of his most representative pictures were exhibited at Art Basel in Miami. His vision dives deep to the core of African culture, in search of what stands most true to them, who they are; and a primeval race which is seeming to fade within the shadow of capital expansion. The imagination of the artist imagines to recreate in his own way what is now permanently corrupted by progress and globalization. His images “are compared because of the tricks of light and shadows to the works of Dutch painters, they recreate the warm and dreaming intimacy typical of a classical vision of backgrounds far from western reality”. 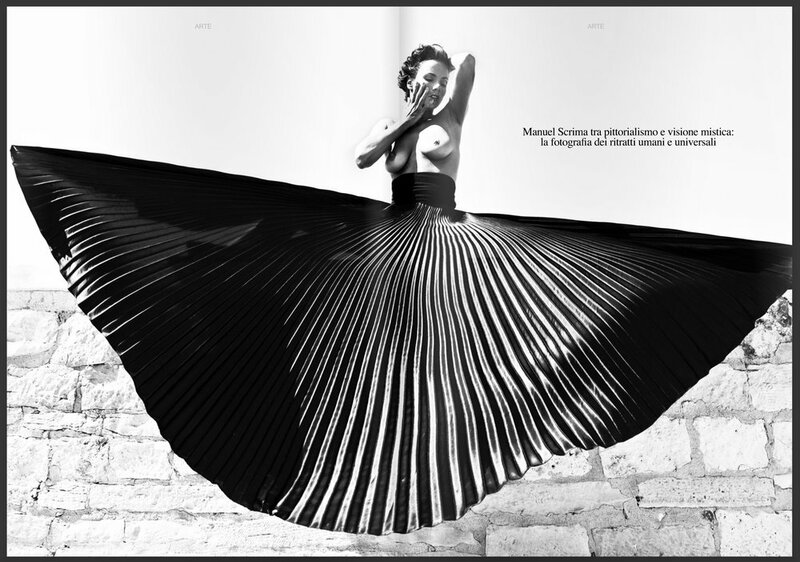 In 2009, he returned to Milan and decided to engage with a new world: commercial photography and fashion. And within a short period of time, he began to shoot for many brands including: Yamamay, Carlo Pignatelli, Romeo Gigli, Silvian Heach, Lancetti, IKEA. In 2010, he began his adventure and collaboration between Asia and Europe with the artist and designer Angelo Cruciani. With him he establishes several projects converging between Art, communication and Fashion (i.e. Made in China, She’s Not A Man). In 2012 his Afreak exhibition, curated by Alessandro Turci, is part of the Italian Photo Festival. Here he compares African and Asian cultures. Through images and video installation he is trying to understand how that world - a primeval race, so majestic and true, has now become contaminated by other cultures voracity and by technology. His images are meant to spark an awakening in our understanding of African culture. A video shows a Kenyan shopping mall and Maasai village, a few hundred kilometers in the distance. “This comparison start from the need of getting back our consciousness, our authenticity and therefore our ability to discern” . He is currently working on art projects ranging from abstract photography to the reinvention of landscapes. It’s a research that reinterprets the neoclassical aesthetic with kaleidoscopic images and collages. "The human becomes a language or rather a writing that phrasing in an attempt of a reconstruction and aesthetic significance". His unpublished works are planned to be displayed at the beginning of 2016. He took also the images of the recent performances and flash mobs about love promoted by Angelo Crucian (2014-2015-2016-2017) and several photographic works-painted exhibited in LOVVISM (2015). He is currently the image director of Yezael in Milano. -KENYA WEEK – AUTHOR OF AN EXHIBITION FOR UNESCO ABOUT KENYA TRIBES.